There's a convention held once a year called the Game Developers Conference, which is the largest convention in the world on the creation of games. True, it tends to focus on video games, but analog games get a little representation. In fact, this year I was one of those representatives. I gave a speech about the many lessons I've learned during the 20 years I've spent designing the same game. If you would like to see my speech in actual speech form, you can click on the video below and watch it (it's about an hour long), but if you're the kind of person who prefers reading over listening (or you just don't have an hour to spare), I'm going to turn my speech into a three-part column. I hope you enjoy it. Last year, I celebrated my 20th year of making Magic. Since 2003, I've been the Head Designer of Magic. I've done something that few people have in the game industry: I've spent 20 years making the same game. Most games don't even last 20 years, so it's a relatively rare feat. Since I began at Wizards of the Coast, we've made 86 randomized booster products, 69 non-randomized products, and many other online, licensed, and miscellaneous products. In that time, we've designed over 14,000 unique cards. Looking back at my 20 years, I realize I've learned a lot. I figured 20 lessons—on average one per year—was a good amount for an hour-long speech. Note that these lessons are not chronological and don't represent a specific amount of time (I don't have one lesson for each calendar year). They're in the order that I felt made sense. For each lesson, I will start by giving an example about something that happened during my Magic-making career. I will then share the lesson and talk a little bit about it. My first lesson begins back in October of 2006 with the set Time Spiral. In it, we had a mechanic called suspend. Suspend was a mechanic that let you trade time for money—or mana, in Magic's case. Normally when you play a spell it resolves right away; with suspend, you got to pay much less for it, but in exchange you had to wait some number of turns before it got cast. Let's take the card Errant Ephemeron as an example. If you want to cast this card normally, it takes seven mana—but if you cast it with suspend, it only takes two mana. The catch is that you have to wait four turns before it enters the battlefield. So, here was the problem. In playtesting, we found that players kept wanting to attack with the suspended creatures as soon as they were cast. But the Magic rules don't normally allow creatures to attack the turn you cast them unless they have the ability haste, which lets you override this rule. When we explored the issue, what we found was that because they had waited so long to get the suspended creature, players associated the creatures finally getting cast with them mattering, so it felt appropriate to attack with them right away. In game design (and most things where you interact with an audience), there's a saying: "Know your audience." Well, guess what? Your audience for game design is humans. They come with a complex operating system. It's quirky at times, but it can be understood. Just remember that humans are quite stubborn. They like to do things the way they like to do them and it's hard to change their behavior. What I've learned over the years is that you shouldn't change your players to match your game; you should change your game to match your players. Don't get yourself into a fight you're probably not going to win. Human behavior is a powerful force. We are creatures of habit and instinctually fear change. Yes, there are things that come along—like the cell phone—that humans change their behavior around, but don't assume your game is going to be one of those revolutionary things. And it wasn't close. More people complained about this card than all the others combined. Why? Was it about power level? Nope, Griselbrand is very powerful, even showing up in older formats. Was it a flavor issue? Nope. Liliana is among our most popular Planeswalkers, and Griselbrand is one of the four demons Liliana made a pact with for eternal youth. He's dripping with flavor relevance. The first lesson talked about human behavior. This second lesson talks about human perception. In college I studied communications, and one of the classes I was required to take focused on aesthetics. Aesthetics has numerous nicknames. It's known as both the "philosophy of art" and the "science of beauty." It's the scientific study of how humans perceive the world. Scientists learn about aesthetics by traveling the world and asking people from different backgrounds, different geographies, different cultures to all record how they perceive things. What they found was that there are a lot of similarities that cross all boundaries, that seem tied to how the human brain works. There are just certain qualities that the brain seeks out, things like balance, symmetry, and pattern completion. The result is that in games, people expect the components of a game to have a certain feel. I'm not talking just about visual aesthetics (Magic tends to excel there), but how the game pieces are put together—whether or not they feel right. Failure to satisfy aesthetics makes players feel ill at ease, distracts them from focusing on your game, and makes them pay attention to what your game isn't instead of what it is. Aesthetics aren't just a decorative issue. They affect how your players perceive your game. So not only shouldn't you fight human behavior, you also shouldn't fight human perception. ...it has a far greater impact on them than anything we could have created in a vacuum. Your audience has a deep deposit of emotional equity in preexisting things. As a game designer, that's a tool you should make use of and build upon. This lesson is that some of your tools come from the players themselves. Your audience has a huge pool of emotional equity that you can tap into if you know where to look. This lesson takes us back to September of 2013 and the Theros expansion. 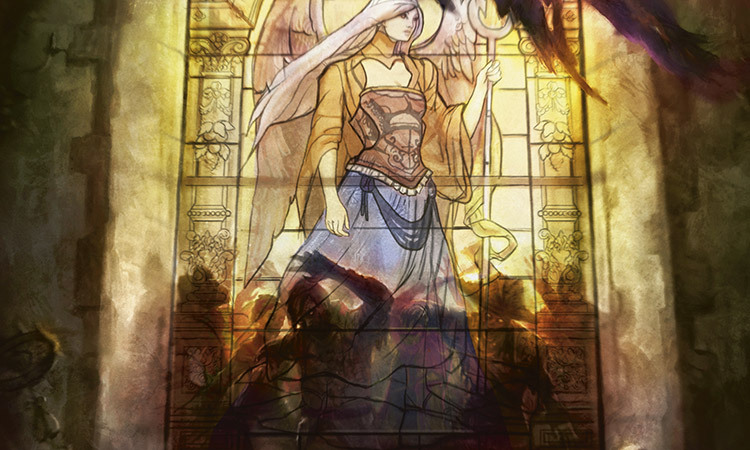 Theros block was inspired by Greek mythology. As with Innistrad, the design team spent a lot of time designing individual cards that hit upon tropes of the source material. One card we made (a Ken Nagle special, I believe) was called "Trojan Horse" in design. It was a 0/4 defender that the opponent gained control of when it entered the battlefield. Then at the beginning of the now-controller's upkeep, each of that player's opponents got a 1/1 Solider creature token. You snuck your Trojan Horse past the walls of your opponent's city and soon Solders started spilling out. In early playtesting, people loved the card. We got a lot of positive feedback on it. At one point, the creative team started working on concepting it. As there is no Troy on Theros, the name got changed from Trojan Horse to Akroan Horse, for the city of Akros. The person concepting it then had an idea. What if instead of a wooden horse, they played around with the trope? What if it was a wooden lion? The name got changed from Akroan Horse to Akroan Lion. Akroan Lion got a very different reaction than Trojan Horse. Playtesters loved Trojan Horse, but didn't like Akroan Lion. Why did you have to give it to your opponent? And why did it make Soldiers? The card just didn't make sense. We had changed it enough that players no longer made a connection—and thus it felt like a random card with weird, unconnected abilities. We eventually changed the name back to Akroan Horse and got art showing a wooden horse. Then everyone loved it again. It turns out that resonance has another valuable use. It can be a teaching tool for game mechanics. Piggybacking is a term defined as "the use of preexisting knowledge to front-load game information to make learning easier." A good example is how flying is so easy to teach. There are simpler mechanics, but none as intuitive as flying. Whenever I teach people about flying, they always react the same way: "Oh, I get it. It flies." My one other example of piggybacking comes from a non-Magic source. George Fan, the creator of Plants vs. Zombies, is a big Magic fan (no pun intended), and he visited the offices a few years back. He and I got to talking about why he chose plants and zombies as the two focused creatures in his game. George explained that he needed forces that you could put in place that wouldn't move because, in tower defense games (the game archetype of Plants vs. Zombies), your forces aren't allowed to move around. George chose plants specifically because they convey the idea that once placed, they can't move. They're planted—it's even in the name. Zombies came about because George needed a slow attacking force that came in waves. Zombies conveyed slowness and numbers and waves. So the choice of both plants and zombies was done deliberately to help make learning how the game worked easier, because the creatures functioned as you would intuitively expect from your previous associations. When designing Odyssey, I got it into my head that I wanted to mess around with the concept of card advantage. I was interested in taking something that the top players all agreed was universally a good thing and turning it on its head. How did I do that? Well, let's start by looking at this card. This is Patrol Hound. It has an ability that allows you to give it first strike by discarding a card from your hand. Interestingly, gaining first strike wasn't very important. You wanted the Patrol Hound on the battlefield so you could discard as many cards from your hand as needed. Why? Because of cards like Krosan Beast. You see, Odyssey had a mechanic called threshold that "turned on" if you had seven or more cards in your graveyard. Krosan Beast, as an example, went from a 1/1 to an 8/8. So if you had seven cards in your hand, you could discard them all to Patrol Hound to turn Krosan Beast into an 8/8. This was often the correct strategic play even though it flew in the face of card advantage. 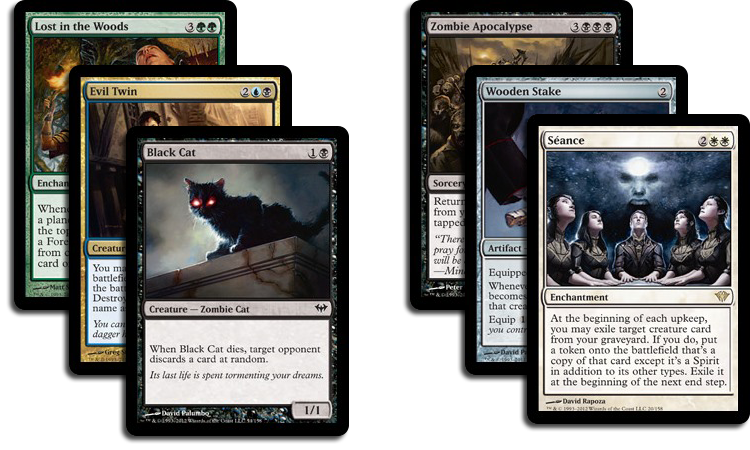 So what did the players think of this set that warped a Magic theory fundamentally? Lesson #5: Don't confuse "interesting" with "fun"
This is a concept we talk about a lot in R&D. It turns out that there are two different kinds of stimulation—intellectual stimulation and emotional stimulation. The first is about stimulating the ways in which you think. ("Hmm, that's very interesting.") The second is about generating an emotional response. ("Ooh, that's fun!") In Magic, looking at a card file is intellectual stimulation. Playing with the cards is more of an emotional stimulation. The lesson here is that, in general, we humans like to think of ourselves as intellectual creatures. But interestingly, when scientists study how we make most of our decisions, it's not based on facts. Humans are much more motivated in their decision-making by emotions rather than thoughts. This means when making a game, you can have it speak to your audience on an intellectual level or an emotional one. Both are valuable, but when you speak to a player on an emotional level, you're more likely to create player satisfaction because for most people, emotional satisfaction runs deeper and is more core to how they respond. Often when we are playing around with new ideas in R&D, we ask ourselves, "Is this interesting or is this fun?" Is this a card that's neat to read and think about or is this a card that's enjoyable to play? Because the latter is going to get you closer to creating the emotional response you're trying to build with your game. For the next lesson, we return back to the design of Innistrad. Innistrad was the first time I designed a set starting with the flavor and working from the top down. Early on, I was trying to wrap my head around what reaction I was trying to evoke from the audience. Not sure where else to turn, I decided to focus on the source material for our top-down designs: the pop culture of the horror genre. What was it that drew people to horror and was there any way for Innistrad to mirror that? It was this discovery that led me to an important realization about Innistrad's design. I wanted to scare the players. Fear is a driving force of horror, and I wanted to see if I could use the game mechanics to help evoke it. The design team focused on dark transformation, where innocent things turned into dark, sinister things. I knew when a player saw the front side of a double-faced card, they'd start to worry if the backside was something that was going to cause them problems. We made the morbid mechanic, which rewarded death. This made simple things like attacking and blocking take on a whole new aspect. Should I block and kill my opponent's attacker...or is that exactly what she wants me to do? Flashback, likewise, had spells that sat in the graveyard with the threat that over time that they were going to come back to cause more problems. Each piece of the design worked to create a sense of suspense to make the player a little more wary than normal. An ongoing theme here is that a game designer has to be very aware of how a player reacts emotionally to the game. If you want to be successful, you need to understand what exactly it is you want your audience to experience. In order to know what to put into your game, you have to understand what you want to come out. You have to continually ask yourself, "What impact will this game choice have on the player experience?" That means, if a component doesn't contribute to that overall experience, it has to go. "No scene is worth a movie, no line is worth a scene." That means no matter how good a scene is, if it's not serving the movie, it has to go. Likewise, no matter how good a line is, if it doesn't serve the scene it's in, it has to go. The same applies to your game. Everything in your game has to contribute to the overall emotional output you're trying to create, and if it doesn't, it has to be removed. I could have the greatest card—but if it isn't evoking the sense of suspense I want to create in Innistrad, it does me no good to put it in the set. In fact, if it pushes in a different direction, it is actively doing my game harm, even though the card might be wonderful in a vacuum. This all means that you have to take a critical eye to each component of your game and make sure that it's pushing your game toward its goal and not away from it. If it's leading you the wrong way, it has to go. That's all the time I have for today. I'm very proud of this talk, so if you have any feedback about it or how it's being adapted in this article, I'd love to hear from you. You can email me or contact me through any of my social media accounts (Twitter, Tumblr, Google+, and Instagram). Join me next week for part two. Until then, may you design a game and learn lessons of your own. "Drive to Work #334—Twenty Lessons: Aesthetics"
I have turned my GDC talk into a series of 20 podcasts, one on each of my lessons. This podcast is the second in the series, about the lesson "Aesthetics Matter." One of my duties as a spokesperson of the game is to do a lot of interviews. This podcast tells stories about many of the interviews I've done and shares some tips about how to do a good interview.